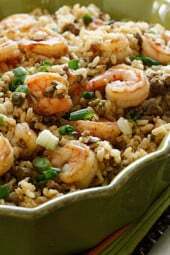 A healthier twist on a Cajun classic, the addition of shrimp turns this “dirty brown rice” into a fabulous main dish. 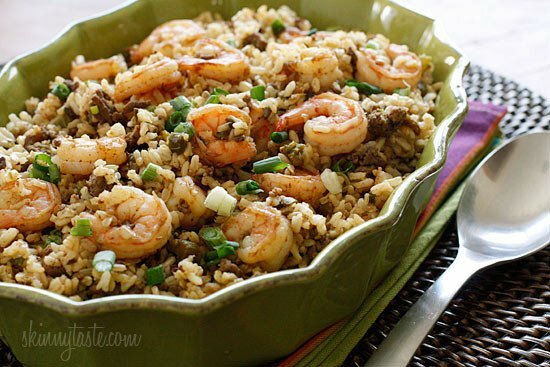 I’d like to think of this as a Cajun shrimp fried rice. With Mardi Gras ending tomorrow, I thought this would be the perfect timing to share this recipe from the archives because I LOVE this dish! 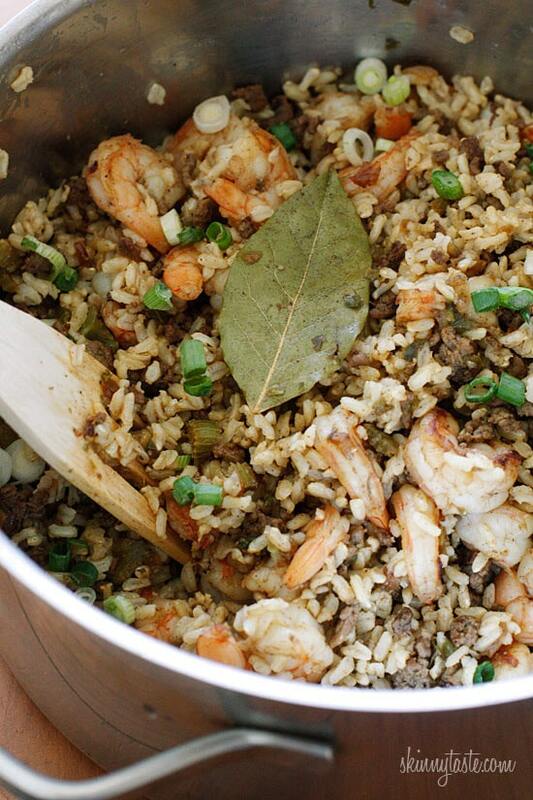 Dirty rice is a classic Cajun dish made “dirty” by cooking the rice with minced livers or gizzards. I created a healthier version using brown rice and lean ground beef in place of the chicken livers that normally make dirty rice “dirty”. But don’t worry, this healthier version does not skimp on flavor! It has plenty of spices and a bit of kick, you can adjust the heat to your taste but don’t be shy with the cayenne if you can handle it! Normally a rice dish like this if made with white rice would be cooked all in one pot, but after several attempts to perfect this I found that cooking the brown rice all together created an unpleasant mushy texture. 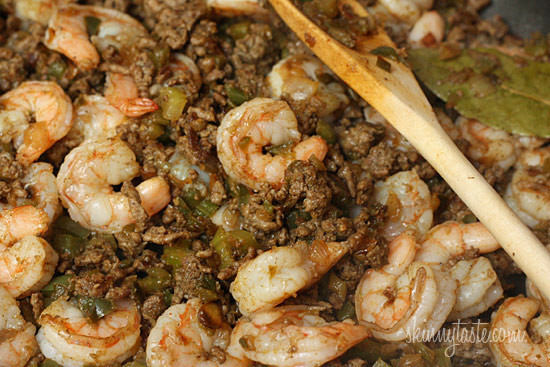 By cooking the brown rice separate, the texture of the rice was perfect when mixed with the beef and shrimp and made a delicious main dish even my “non-brown rice eating” husband enjoyed. 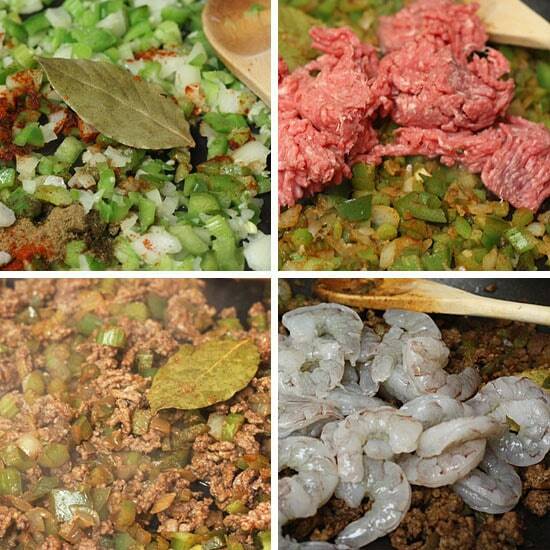 Sauté until browned, about 10-15 minutes; add shrimp, cover and cook 5 more minutes. This was incredible! Hit the spot for the entire family. Thank you for yet another wonderful recipe! Excellent meal. Used 3/4 lb ground beef. Doubled sauté & cooked beef & veg longer & cooked shrimp for 10 min. Adjustments are probably my pans & stove. Rice takes 45 min & cutting & cooking come out about same. Great taste. Anyone try this with cauliflower rice? Delicious! Definitely going to make it again. This was delicious. I made it in the Instant Pot (did the brown rice first, then made everything else on saute mode). I made 3 cups of (uncooked) brown rice and left a little more than half in. Forgot to add the seasoning to rice before cooking so I added after. Didn’t have onions so I subbed in 1 tbsp of onion powder, didn’t have bay leaf so left out. Had jumbo shrimp so I cut them in half length-wise. No scallions so garnished with some parsley flakes. But followed everything else! It didn’t take quite as log as the estimates to get my peppers soft, or cook through the ground beef and shrimp, but everything came together very well. I was really pleased with the flavor – not too salty, just a little bit of a kick from the cayenne, but most importantly, there was great depth of flavor. Could not tell it was brown rice. Didn’t feel heavy at all. Will definitely have to make this again! 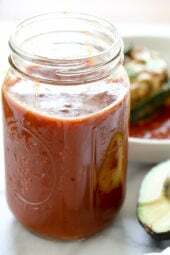 Shared the recipe with the Instant Pot Community and received almost 100 shares and over 200 likes so that might drive up the traffic here :). Thank you for the great recipe! Love this recipe! Made a while back and just now found it again. After reading through the directions i noticed under #1 that you say to add 1/4 tsp of salt AND another 1/8 tsp of salt. That seems like a typo so could you clarify for me on the salt amounts? Hi Gina, your recipes are amazing! I am doing freestyle. How many Freestyle points per serving if I use ground turkey instead of beef. Thank you so much. Sorry don’t have that info handy! Toy really should specify what type of green peopl pepper should be used. There are many types of green pepper. To me, green pepper means green bell pepper and that’s what I used and it was amazing! Made this for dinner and it was amazing and my whole family loved it!! It had a lot of flavor and texture. I will definitely be making this again! Do you think this would work with quinoa? I followed your recipes faithfully and I have every recipe I have tried. I lost 50 pounds in 8 months and I have been delighted. I am back to find more new and exciting WW recipes. 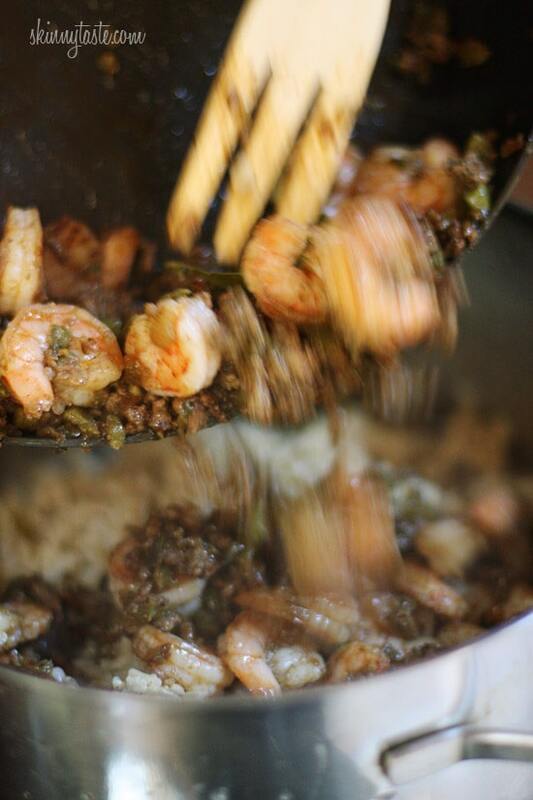 My whole family loves the DIRTY BROWN RICE WITH SHRIMP. It is a family favorite. Thanks for sharing these recipes with us. I do not like the New WW. But thanks to you I can still keep up with my points. Would this work with white rice? Really delicious! Another winner! My hubby really liked it and asked that it go into regular rotation. Thanks! Made this twice in the last week! So good, everyone enjoyed it! Thank you for creating this recipe. Made into the T! It was an excellent recipe. I often struggle with brown rice, this was a pleasure to eat. 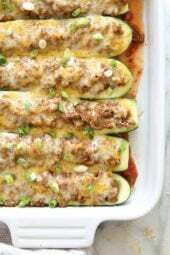 Made it a second time, substituted green bell pepper for seeded jalapinos, it was GREAT. Made this last night. It was incredibly delicious. I used black rice (what I had on hand) and very thinly sliced chorizo in substitution of the ground beef. yum! I never leave comments when I find recipes but his recipe was so delicious, nutritious flavorful and healthy i just had to! I made it with a whole pond of ground turkey and it was a success!! 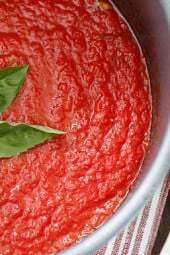 I will look at more recipes on your site! Thanks! Can you use something in place of the bouillon? I just made this for my family and everyone liked it! It's an easy recipe and a keeper for us now. Thanks! Gina, can this be made as directed and then frozen to heat up and serve later? I am doing a freezer cooking day and have pulled this recipe to make- again! We made it once before and it was delicious and loved it! Wondering this time if I could freeze it? thank you! Gina I made this last night per recipe and it was outstanding! I am enjoying your website and have your chicken taco chili in the crock pot today. I am trying to lose weight and don't want to go on a crazy diet so I am trying out your recipes. Thank you for so many of them to chose from! Another great meal! Thank you Gina!!!!! holy cow, what did I do wrong? I made this last night and all I could taste was the chili powder. I double checked to be sure I had read the recipe right and I had.The taste was just mediocre and then the Chili pepper drowned out everything else. Everyone else's review says this is tasty, so I figure i must have done something wrong, but I wasn't overly excited about the flavors in it. Chili powder is not one of the ingredients. I am making this for the second time as we speak. My husband LOVED it the first time I made it and has asked me several times to make it again! I will be having a few friends over for dinner and this will definitely be on the menu! So glad I found this website! My husband made this the other night and it was amazing! We are making this a regular dish in our house. Thanks! Amazing dish! I made this last night and even my food snob husband was impressed! Only thing he added was garlic powder! For leftovers, I cut the shrimp in pieces and put 1/2 a serving in a green pepper bowl (the whole serving would have probably fit in a whole green pepper easily). Oh my goodness this was so good! I've lost a total of 55 pounds with WW, but currently I am stalled in a plateau, but your recipes help keep myself in check and the weight off! I gave your website to all my friends on instagram LOL ! Thank you so much Gina! I am trying to get more into meal planning to help cut down on time spent in the kitchen. This is on my meal plan for this week and I was wondering how it tastes the next day? Some dishes are better the day after and I would love to make ahead some of my meals. This is on the menu for tomorrow but wouldnt mind starting today. Also do you think it would freeze well? I like to freeze left overs in small portions to take out for a lunch etc. Thanks! To answer your question about prepping ahead of time, that is exactly what I did for this recipe. I washed and chopped the onion, celery, and pepper and put them into a zip-loc bag. I also measured out the spices (for both steps) and put into little food prep containers that I have.Then, when I get home from work, all I have to do is assemble. All the cleaning, chopping, and measuring are already done! I tend to do this for most of my weeknight recipes. I prep everything on Sunday when I have more time. Made this Tues as an homage to Fat Tues. It was great. Spiced perfectly. Not too hot. I did use lean ground beef. I dont do turkey. I just made this but by accident I added a whole pound of lean ground turkey.. Do you have any suggestions on how much i should have as a serving size to keep calories below 400???? Fabulous! Used the long cooking brown rice and now I am a convert! Tossed out the quick cooking stuff. Great recipe! A keeper! I used 1/2 pound ground chicken, because that is what I had on hand. Will not hesitate to throw in a whole pound! This is definitely one of my most favorite Skinnytaste recipes ever. Ground turkey works quite well. I made it tonight and it was great. Also using it without the shrimp for stuffed peppers.